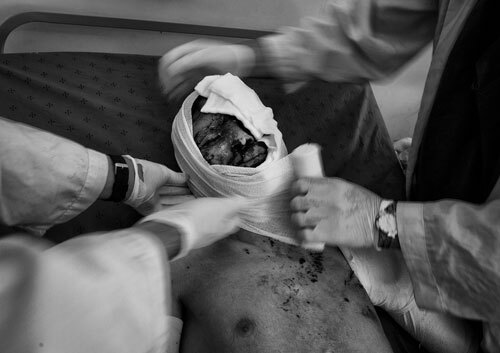 Habibullah gets his dressing changed by the medical staff at the Intensive Care Unit (ICU) at Mirwais hospital on his scared face after he became seriously injured from aerial bombing near his home in Panjwar October 12, 2009 Kandahar, Afghanistan. 2009 was the deadliest year in terms of civilian casualties in Afghanistan ever since the start of the U.S.-led war against Taliban in the country. The Taliban are now staging suicide attacks and IED blasts in densely populated areas to create a bigger impact as more of Afghan's war wounded hit the headlines. Relations between Afghans and the American and NATO forces have become more fragile with every passing day.